The costume history image in our minds of a woman of the ‘Roaring Twenties’ is actually likely to be the image of a flapper. Flappers did not truly emerge until 1926. Flapper fashion embraced all things and styles modern. 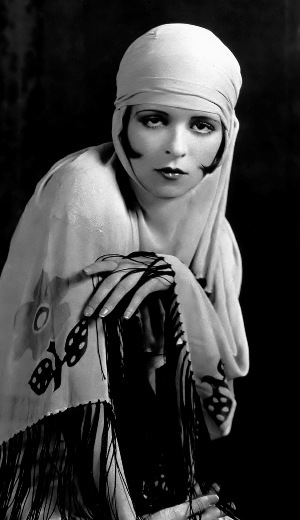 A fashionable flapper had short sleek hair, a shorter than average shapeless shift dress, a chest as flat as a board, wore make up and applied it in public, smoked with a long cigarette holder, exposed her limbs and epitomised the spirit of a reckless rebel who danced the nights away in the Jazz Age. I think this is quite funny that there were known as reckless rebels a term I would more associate with Punks. 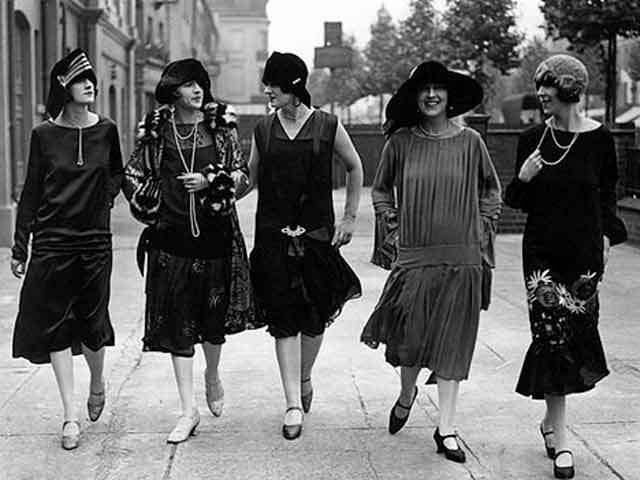 People often mistakenly assume that all dresses, day and evening, were short in every year of the twenties and that flappers were the only fashion style of the twenties. Dress and coat lengths were actually calf length and quite long for most of the decade. Shortness is a popular misconception reinforced by the availability of moving film of the Charleston dance which shows very visible knees and legs on the dancing flappers. After the first world war (1914-18 women’s fashion became more masculine. Female clothes became looser and more shapeless in fit. The bust was suppressed, the waist disappeared, the shoulders became broader and hair shorter and shorter. Narrow boyish hips were preferred. The silhouette emphasised a flattened chest and womanly curves were eliminated as the line became more simplified. By 1920 the silhouette of Coco Channel’s clothing designs became to be the epitome of 20’s style. The work of other famous designers beside hers seemed old fashioned. She promoted the styles we associate with flappers. She worked in neutral tones of beige, sand, cream, navy and black in soft fluid jersey fabrics cut with simple shapes that did not require corsetry or waist definition. They were clothes made for comfort and ease in wear making them revolutionary and quite modern. She was the Jean Muir or Donna Karan of her day and the originator of the LBD – that little black dress. Loose fitting drop waist dresses with simple fluid shapes. Short haircuts and women wore and applied make-up in public, something never done before. neutral tones of beige, sand, cream, navy and black in soft fluid jersey fabrics with an added bit of sparkle, usually beading.